The world's first metro system, London Underground opened in 1863. Today, there are 160 metro systems in the world. 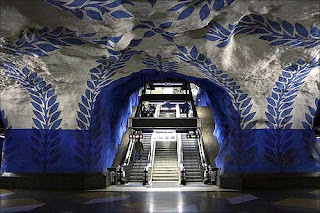 The Stockholm Metro is one of the most beautifully decorated stations. There are 100 stations on this route with a daily ridership of 1,122,000. It was the idea of artists Vera Nilsson and Siri Derkert to use art to beautify the metro stations. Today, besides holding art exhibitions, the works of more than 100 artists are showcased across 90 stations in the country. The Metro began operations in 1950.